These Buttermilk Berry Muffins have a beautiful golden brown crust and are absolutely bursting with flavorful berries. No need to worry if fresh berries are not in season, as these are just as good with frozen berries. To add a nice touch of citrus flavor, the zest of a orange or lemon is added. And to make these Buttermilk Berry Muffins wonderfully moist and tender, almost bread-like in texture, we are using buttermilk and a flavorless oil instead of the usual milk and butter. Muffins fall into the "quick" bread category and you can see why when you make this recipe. All you need are two bowls; one for the wet ingredients, and one for the dry. Combine the two and your batter is made. Of course, just because they are simple to make doesn't mean they can't be packed with flavor. If you use frozen berries, instead of fresh, in these muffins, do not to defrost the berries as this will cause them to soften and bleed into the batter. As I mentioned above we are using oil in this recipe instead of butter which makes the muffins wonderfully moist and tender because oil prevents the development of gluten in the flour. You can use canola, corn, vegetable, safflower, or even a mild olive oil in these muffins. If you are not familiar with buttermilk it has a nice thick creamy texture with a rich tangy buttery taste that makes baked goods tender. Whereas in the past buttermilk was made from the liquid left over after churning butter, it is now commercially made by adding a bacteria to whole, skim, or low fat milk. There can also use buttermilk powder, or you can make your own buttermilk by adding 1 tablespoon of white distilled vinegar, cider vinegar, or lemon juice to 1 cup (240 ml) of milk. Just stir the vinegar into the milk and then let it stand 5 to 10 minutes before using. 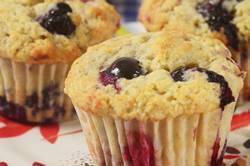 These Buttermilk Berry Muffins are delicious warm from the oven or at room temperature. Buttermilk Berry Muffins: Preheat oven to 375 degrees F (190 degrees C). Position rack in center of oven. Line with paper liners, or butter or spray, with a non stick cooking spray, 12 - 2 3/4 x 1 1/2 inch muffin cups.